PRICE NOW REDUCED. MOTIVATED SELLERS. 'Abundance' is certainly aptly named. Brainchild of Bill Ashmead, a talented designer and boat builder, she was lavished with every attributes one can think of, from her sea-kindly lines to her incredibly comfortable interior. In fact, in years as cruisers ourselves and later as cruising yacht specialists, we have rarely seen a boat designed and built so carefully and equipped so thoroughly. First, the look: 'Abundance' is not the sort of boat that you walk past without noticing. She simply gleams, shows her loving upkeep from every angle. Her lines have that imposing, yet elegant shape that speaks of power and comfort and of ocean voyages. Sitting proudly at Vuda Marina amongst a hundred other cruising yachts hailing from all corners of the earth, 'Abundance' certainly has the 'wow factor'. Second, the design, which is pure genius. With a lifting keel (easily handled centre-board conveniently reducing the draft to a mere 5' perfect for accessing shallow anchorages, to a mighty 11' when you need to point high into the breeze, 'Abundance' gives you the best of both worlds. 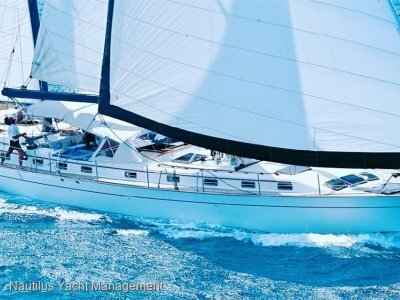 The hull that is well rounded forward of the keel, she will cut through the swell without slamming, (as every modern production boat is prone to do), yet will give you a generous turn of speed at all wind angles. However, if you are feeling lazy or if there is no wind, the motor is big enough to have been chosen for a boat twice this size, and with a range at 7 knots of almost 1000nm you can be as lazy as you like and virtually motor for the whole passage should you need to. Furthermore, the engine is situated in a well-insulated walk-in engine room whose spaciousness is almost unseen on other yachts of this size and provides easy access for all engine maintenance. Her high decks will stay dry well after everyone else's is awash with water, and her transom is high, which is safer than modern boat's open transoms, on which following seas can sometimes climb yet is equipped with a transom that extends to a swim / landing platform which makes boarding easy and safe. True to her cruising yacht description, her transom is equipped with a beautifully designed tower with separate davits allowing you to easily launch and haul out the aluminium RIB dinghy, and supporting 560 watts of solar panels and a powerful yet quiet wind generator. 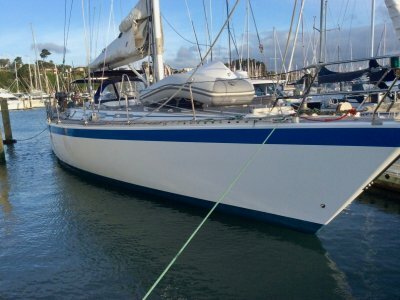 The cockpit is large, safe and very well protected from the weather with all around clears, a hard dodger with opening hatches and Bimini. The companionway is offset to the starboard side, which increase the sensation of space and help ease traffic in the cockpit when things get busy. All control lines are led aft for total comfort and ease of use, and of course you can control the sails at the push of a button. 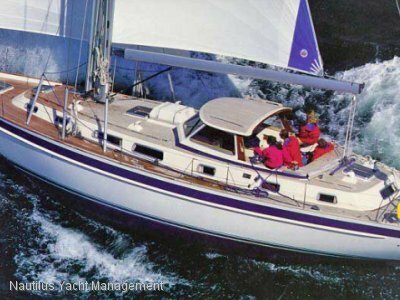 Set up for short-handed, or even single-handed cruising in maximum comfort and least amount of fuss, the sails are all furling, easily handled, and even the asymmetrical spinnaker comes with a sock that makes it very easy to douse. The rigging, as the sails, were replaced in 2014 and are in very good condition, having always been kept away from the sun and weather when not on a passage. Third, really comfortable accommodation: Again, where to start? There is just too much to tell here, so we will leave the full inventory to the a separate section and keep to the essentials. Coming down the steps, the impression of space is impressive. The fit-out is for the most part solid timber that is simply luminous. In spite of her age, ' Abundance' shows very little signs of wear and tear. The saloon, which is positioned to offer comfortable sitting / dining area for 6 people curves around a beautifully varnished table opposite a lovely settee. Adjacent the salon is the galley, which is perfect for gourmet cooking but safe to use at sea. The galley is equipped to rival a superyacht. The fridge and freezer are hidden behind a sumptuous cabinet that is a work of art in itself. Although it looks delightfully rustic, the systems are very modern and were installed in 2013. Freezer and refrigeration are separate and use the Frigoboat system with evaporator plates, 12 volt with Danfoss compressors and keel coolers. Electronic controllers for both well-insulated boxes which afford approximately 9 cubic feet of total freezer and refrigerator space. Both can become refrigerators. The refrigerator has built-in adjustable height shelving. The galley countertops were custom-made of Staron solid surface by Samsung in 2015. There is a good size stove and oven on gimbals, as well as full size microwave oven and two ice-makers (one portable and one built-in. There are two sinks, with single-lever sink fixture and under sink 3M water filter for drinking. 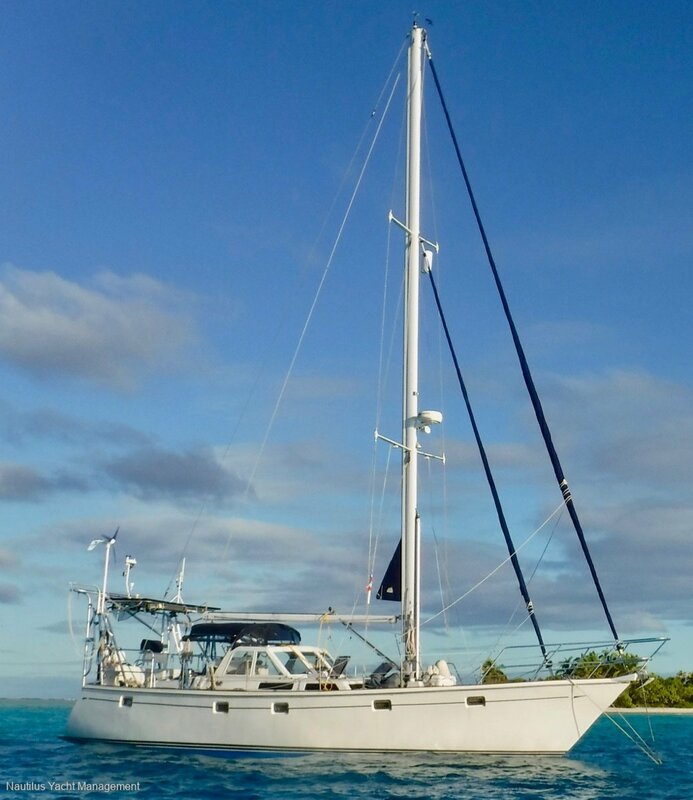 On board 'Abundance' safety is paramount, so the boat is fitted with Two-station propane leak detector, at tanks on aft deck and under stove in galley and an electric solenoid switch at galley integrated into S2A warning panel for added security. One of the best feature on this boat is the absolutely royal owner stateroom situated aft of the companionway. Occupying almost a third of the vessel it is almost an apartment in itself, with a queen size island berth fitted with a very comfortable custom mattress in memory foam, vanity with mirror, flat screen TV mounted on the wall, ample storage for hanging and folded clothes and access to the owner's ensuite, which is large, well ventilated, and equipped with electric toilet and a full walk-in shower. For maximum privacy and to make better use of the space on board, 'Abundance' as many US designed yachts, only has one other cabin, which is at the other end of the boat in the bow, and which has a very large double berth and is adjacent another full-size head area with electric toilet and walk-in shower and vanity with mirror. Going back to a more technical subject, 'Abundance' is again equipped as a veritable superyacht, which every electronic short of a forward-looking sonar (although there is a fish finder that shows a very good underwater relief) All the details for the equipment regarding the electronics, electrics and other equipment / inventory are listed in details in a separate section. For more info or to organise for an inspection or to obtain the full brochure please contact Anna at Nautilus Yacht Management. Encapsulated lead keel with cable-driven centre-board. Caframo model 727/757 fans throughout. 7 in total. Huge Master cabin Aft with ensuite head and separate shower. 2 hot and cold showers in separate shower stalls with screen doors. Another shower after deck. 2 X burner stove with oven and grill. Spectra Catalina 300 watermaker, produces 13 GPH, 12 volts. New 2015. State of the art Electrical installation complete with galvanic protection. 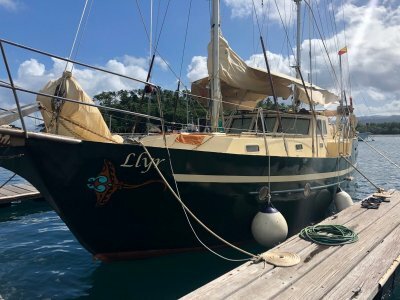 The owner is an ABYC certified marine electrician. Eight East Penn AGM golf cart batteries (GC-2) form the main bank, about 750 amp-hours. These batteries were installed in December of 2014.